Discover the little known treasures of Tavira and its surroundings or spend time at home - Quinta Tara, your own private paradise! 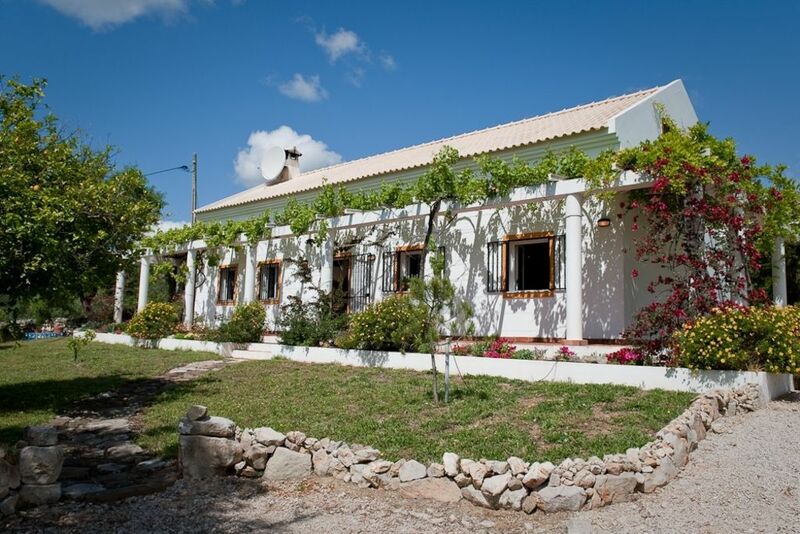 This luxuriously fitted villa that sleeps 6, overlooks the rolling hilltops of the Asseca valley, an 8 min walk from the amenities at Prego and a 8 min drive from the quaint and historic town of Tavira. A variety of white, sandy beach islands and lagoons are within a 10 min drive. The house attracts plenty of sunlight and is a wonderful space for families. Breakfast under the almond trees, lounge around and swim in the refreshing pool, have a fresh fish barbeque on the terracotta patio and then catch a beautiful sunset from the roof terrace absorbing the varied hues and rolling shapes of the landscape - enjoy your holiday! Catch the sunsets from the roof terrace and dine al fresco: Quinta Tara has plenty of space for seating under cover of the terrace and the dappled arbor of the vines and jasmine or in the full glory of the sun. There is a brick-buit barbeque and a large patio area poolside overlooking the many almond and lemon trees within the properties’ stone walled perimeters. Quinta Tara is a very comfortable home from home. A long wooden table for dining with seating for 6, leads to the fully equipped modern kitchen. The fitted kitchen has a dish washer, 5-ring gas hob, an electric oven, a large fridge and freezer, a microwave, a kettle and toaster. The kitchen has beautifully finished units and granite surfaces with ample storage. Also on the ground floor is the double and twin bedrooms, and beautifully tiled bathroom with bath. A spacious master bedroom with en - suite bathroom with power shower opens onto a galleried landing. The gallery overlooks a large high ceiling living room with 3 large settees and a farmhouse-style inglenook fireplace with a cast iron stove. There is a large flat screen television with local cable channels and a dvd player. All windows are double-glazed with fitted mosquito nets, consistent throughout the accommodation, there is plenty of cross- ventilation. The bedrooms all have ceiling fans. Quinta Tara has unlimited wireless internet access. We can supply a cot, linen and high chair, charged at 20 euros per week. Please let us know if you have any other requirements. A spacious, sunny and shaded terrace surrounds the house with pergolas of grape, wisteria and bougainvillea. A rooftop terrace can be reached by exterior stairs. A pretty mosaiced pool with dimensions of 8m x 4m and a depth of 1.8m leading to a shallow end of 1m has far-reaching views of the Asseca valley and is very secluded. The pool is terraced and has an outdoor shower and a built-in barbeque area at one end. The half-acre garden has almond, lemon, orange and fig trees and is enclosed by a dry-stone wall. There are a couple of cafés within approximately 10 minutes walk and restaurants within 5 minutes drive, with a greater selection available in Tavira, 8 minutes drive away. The golden beaches of Ilha de Tavira and Barril can be reached in 15 minutes by car. Both are accessible throughout the year and are blue flag beaches. We recommend having a car at Quinta Tara, especially in the heat of summer…and for reaching all the beautiful and interesting places further afield. Car rental, taxi transfers and bicycle hire can be organized with local reputable firms in advance or by calling the local representative. The changeover day and time is flexible, though we aim to keep bookings as close as possible. Departure is by 10am and arrival is from 2pm unless otherwise arranged. We provide a once weekly linen and bathroom towel change including a clean of the bathrooms.During longer winter lets cleaning and linen changes are agreed on an individual basis. there is a large dining table inside and a large dining table outside on the shaded terrace. There is a large flat screen television with local cable channels and a dvd player. There are many almond and lemon trees within the properties’ stone walled perimeters. The swimming pool measures 8 m x 4 m with ladder that leads into a shallow end of 1m and a deep end of 2m. The villa is well maintained and feels homely and cared for. The welcome is warm and we had a wonderful stay, taking advantage of all he lovely spots on the terrace patio and garden to relax and spend precious time enjoying the views. Wonderful! Many thanks for your wonderful review. We are so happy that you enjoyed your stay at Quinta Tara and we hope you will come back to visit again at this or another Jacaranda property. Ideal for a relaxing break ! Superb accommodation, well equipped with everything you need. Clean, well maintained, great pool too. Ideal location with 3 supermarkets only 15 mins drive. Definitely recommend this villa to anyone ! Thanks Angie, it was perfect. Many thanks for your comments, we look forward to welcome you back to the Algarve! I've just returned from a week at quinta tara with four friends. We couldn't have asked for more - the villa itself is lovely and slept 5 easily, but we didn't spend too much time inside! The garden is absolutely beautiful, bursting with colour, and we discovered a grapefruit tree overladen with fruit that we squeezed fresh juice from every morning. we had breakfast under the veranda and barbecues by the pool at night watching the incredible sunset. For us the location was perfect - it is secluded enough that we didn't need to worry about staying outside talking late into the evening but we were able to walk (about 25 mins) into sta estavao for an amazing meal at the local restaurant recommended in the welcome pack. We even discovered that there was a concert on in the village and had a great nice of live music and fun. Apart from sta estavao everything else is reachable by car but the supermarket is very convenient (5 mins drive) and beautiful tavira is only about 15 mins drive. The area really doesn't feel overly touristy and almost every restaurant we wandered into had delicious and (with the £ exchange rate) ridiculously cheap food. Ann provided fantastic service, we were able to change our time of arrival and departure without any hassle. Quinta Tara is a real find and absolutely fantastic value for money. I'd recommended it to everyone! Many thanks for your wonderful review - we are very glad you had a good time! You came in a lovely time of year, May and June in the Algarve are beautiful months and Tavira remains tranquil and the beaches quiet! Thanks for being great guests! The dishwasher , container for knives and forks was broken, holes in it. The entrance road was fill with broken cars, washing mashines , and at the house was parked an old car full off tools, did not looked nice. Many thanks for your very helpful feedback. We did our best to rectify the items that we were told about, replacing the coffee machine immediately and sending a repair man to reset the oven door. The washing machine unfortunately had, due to the extreme heatwave, burnt the circuit board out and has been replaced. We will repair or replace all the items now that you have informed us. We provide a 24 hour attendance service, so sorry that we did not know about many of these items ,we would have appreciated the opportunity to rectify these. We do hope we can welcome you back to this or another Jacaranda managed property in the near future. Es ist eine tolle Villa in der Pampa und es fehlt einem an nichts! Das Haus haben wir wie beschrieben vorgefunden. Vielen Dank an dieser Stelle auch nochmal für die sehr gute Wegbeschreibung, womit wir auch im Dunkeln gut hingefunden haben. Warum das schwierig ist? Weil das Anwesen doch ein Stück außerhalb ist und nur wenig beleuchtete Häuser in der Nachbarschaft. Man ist hier also sicher vor zu vielen Leuten - Abstriche gibt es aber für die Lärmbelästung durch die wilden Hund irgendwo in der Nähe. Das ist zwar keine Schuld der Vermieter, ist aber nunmal da. Das Haus an sich ist top ausgestattet. Eine Küche, in der man wirklich viele Utensilien findet. Die Räume sind sehr groß, so dass sicherlich 6 Personen ohne Probleme Platz finden werden. Abzüge gibt es auch hier wieder für die Betten, die - weil aus Metall - leider etwas zu arg quietschen. Alles in allem eine top Anlage. Zum Strand und bis nach Tavira ist man in 10-15 Minuten. Ohne Auto kommt man allerdings aufgrund der Lage nicht aus. Für was auch immer Sie sich entscheiden, Portugal empfehlen wir uneingeschränkt! Wir wurden Euere Informationen bestimmt weiter leiden zu die Besitzern. Hoffentlich können wir Ihnen wieder begrüssen in der Zukunft in einer unsere Häuser. There are three new golf courses in the vicinity . A variety of beaches are along the coast as well as a bowling club, tennis courts and a health clubs. Tavira Island beach is a 10 minute drive away. Reached by a short ride in a charming ferry you will discover wonderful golden, sandy beaches, beach bars and restaurants on an island 10 miles by 1. Sta Luzia village next to Tavira also has the beautiful beach of Barril, situated in a nature reserve and reached by a toy train. Within the Algarve there are over 100 beaches all within an hour to an hour and a half drive. All you have to do is choose!! Golf: For golfers, there is a lovely 36 hole golf club, Quinta da Ria just to the east of Tavira at a place called Fabrica. There is also the less challenging Benamor course, designed by Henry Cotton which opened in 2000 on the outskirts of Tavira. Monte Rei is reached within 20 minutes drive. Property will be inspected prior to arrival and departure and all breakages must be refunded in full. Guests will have a contact number in case any assistance is required. Once weekly linen and towel change, 24 hour contact available with caretakers.